If discordant noise rock is your thing then Essex duo Deniers are the band for you. With their debut album Plan Totality being released on 8th April its perfect antithesis to the safe mainstream. Nik Hammond (vocals/guitar) and Carl Logan (drums/vocals) came together in 2014 with a mutual dissatisfaction of the state of music and a mutual tut at the X-factor generation. It isn’t for the faint hearted, it as if Sonic Youth at their most abrasive decided to procreate with Blacklisters. It can be dangerous territory for noise rock bands, they can turn down the rabbit hole of abrasiveness and never return. 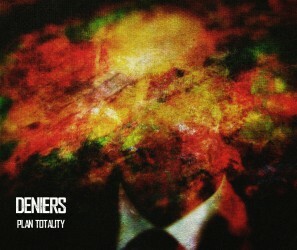 Deniers tread a very fine line between that and the assured noise rock akin to Japandroids. At times it works wonderfully, ‘Knives Out / Bloody Palms’ and ‘Choking on Flies’ are great tracks. Both have a simmering rage and direction that excites and gets the blood racing. Conversely, you have tracks like ‘Yeltsin’ which lacks direction and comes close to irritating the listener and ‘Ojne’ which fails to scratch the surface and leave any lasting impression. ‘Concentration Tongue’ has a sound akin to an early Therapy? while ‘Butchers Hook’ is the most instantaneous, and whisper this, catchy track on the album. Throughout Plan Totality you’ll enjoy the guitar work – at times it verges on the excellent – the same can’t quite be said for the drumming and vocals. Stream the album below and make up your own mind. This is freaking brilliant!! Never heard them before so cheers for the introduction!